Weird Research and Investigating the Haunted (WRAITH) | when is a party not a party? 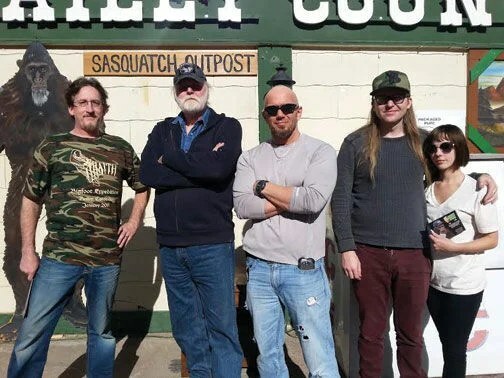 That was one of many questions addressed at the latest “An Evening With Bigfoot,” a presentation series about, well … you guessed it – Bigfoot, also known as Sasquatch, Yeti, Momo, Wendigo and Grass Man. The series is organized by Jim Myers of the Bailey Country Store and Sasquatch Outpost. 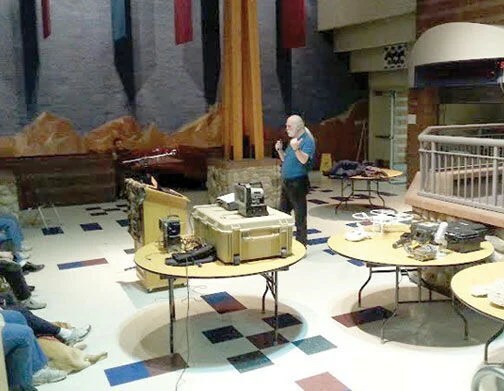 About 80 people attended the event Saturday, Jan. 25 at Fitzsimmons Middle School, which featured guest speaker Dr. Allen Guinn, with Weird Research and Investigating the Haunted (WRAITH), joined by members of his research group, Jake Rast and Travis Worley. Founded about 10 years ago in Kansas City, Mo., WRAITH investigates and researches metaphysical phenomenon not only there but in Kansas and Texas as well. This was the group’s first visit to Colorado and they spent several days doing research in the Lost Creek Wilderness area. Guinn, who has a doctorate in medicine from Tufts University in Boston, is a hand and plastic surgeon in Kansas City. Rast is a medical technician with an electrical engineering degree and Worley trains boxers and mixed martial artists. The meeting started with an opportunity for anyone to share stories about encounters they have had involving Bigfoot. Attendees told of finding large footprints, hearing strange howls and whistles, and even actual Bigfoot sightings. Some people expressed excitement about their experiences, while others seemed uneasy or scared about theirs. Alleged Bigfoot encounters are reported all over the country. With so many accounts over the years, believers want to use these examples of proof, but they are only considered anecdotal evidence. This is where Guinn and his team come in. Many questions are commonly asked by people who want to know why no one has found a Bigfoot yet. Guinn specifically discussed three such questions. First, why are tranquilizer darts not being used? He explained that he carries tranquilizer darts. In reality, they don’t work like they do in the movies. The darts are injected intramuscularly and can take five to 10 minutes to take effect. According to many eyewitness reports, the creatures they saw moved at incredible speeds, far faster than humans and even deer or elk. It would be nearly impossible to keep up with the creature. Because dart guns have a short accuracy range, one would need to be very close to their target to even attempt a shot. The other factor is how much sedative to use. Because the amounts are calculated by body weight, a Bigfoot’s would have to be known to tranquilize it properly. “We can only estimate that number based on eyewitness reports,” he said. Second, why aren’t dogs used to find Bigfoot? Guinn told of a man who provides Bigfoot hunting dogs. He charges $12,000 per day, per dog, needs Bigfoot’s scent, and three months to train his dogs before searching. In other words, you already have to have a Bigfoot to catch a Bigfoot. Many people report their dogs acting strange, scared, or submissive when a Bigfoot is thought to be nearby, though. Third, why are no Bigfoot bodies ever found? Guinn said that research shows under normal conditions, a body will take only three weeks to completely decompose, disappear. “Has anyone here ever seen a dead cougar or bear in the forest you didn’t shoot yourself,” Guinn asked the audience. Guinn thinks that most Bigfoots are habitual as opposed to nomadic, meaning they stay in the same area year round, somewhere secluded. Guinn’s theory is that the creatures live in caves, something he and his team looked for while exploring the Bailey area last weekend. The team uses a vast array of high tech gadgetry in its investigations, including different types of night vision tools, a drone, loud speakers for call blasting (emitting sounds in hopes of a Bigfoot response), and a parabolic microphone to capture sound recordings, including sounds the human ear can’t hear – called infrasonic (below 20Hz). The fact that infrasonic sound exists could ultimately be the clue to finding a Bigfoot. Other animals are known to use infrasound. Orangutans can use it, which is promising for researchers who feel Bigfoots must be primates. The okapi is an animal once thought to be only a myth. It was finally proven real after a body was produced. It has infrasound ability as well, leaving researchers wondering if that helped it remain undiscovered for so long. Infrasonic technology has been used on humans by law enforcement agencies seeking crowd control. It has been suggested that infrasound causes fear or awe in humans and because it is not consciously perceived, it causes people to feel odd or that something supernatural is happening. People affected by infrasound have a feeling of “wanting to get out of there fast,” Guinn said. Infrasound can trigger symptoms of PTSD and leave people with the unexplainable feeling of never wanting to return. It essentially causes a fight or flight response. Many accounts of alleged Bigfoot encounters include feelings of a supernatural presence, or the hair on their neck standing up. Many people run away from encounter areas in fear. Guinn tries to keep his research fundamental by following the principle of Ockham’s razor. “The simplest way is usually the easiest,” Guinn said, adding that it’s important not to overcomplicate things. 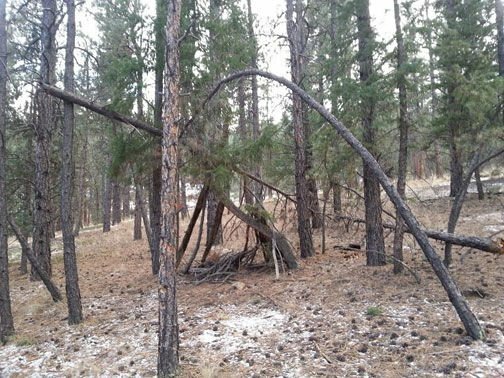 Sometimes people will associate other paranormal activity with Bigfoot. For example, UFO and black panther sightings tend to go hand-in-hand with Bigfoot sightings. “If it turns out that an alien dropped a Bigfoot into the woods, then great, but don’t start there,” Guinn said. In the absence of certainty — the fewer assumptions that are made, the better (so says the principle developed by William of Ockham, an English Franciscan friar and scholastic philosopher and theologian during the 1200s). After Guinn’s presentation, the floor was open for attendees to speak with Guinn and his team members personally. People could also observe casts of possible Bigfoot prints and the team’s specialized field equipment. On Sunday, this correspondent accompanied WRAITH members Rast and Worley on a short field research outing near the Morrow Trail in Bailey. The group was looking for footprints, tree breaks or bends, and any possible hair samples. A couple of curious tree structures were found but no hair samples were collected. “Whenever you see a barbed wire fence, check it for hairs,” he said. Guinn and his group performed field research in the Bailey area until Tuesday.